When a mission goes wrong, 4 soldiers are wrongfully accused of killing a general and are sent to prison. After breaking out, they attempt to clear their names and pity fools. Well, like I said in my review of the Losers, 2010 is the year of the "men on a mission". And no movie could have had more riding on it than this one. The A-Team is based on the iconic 80's T.V. show, so fan expectations were high. I'm a casual fan, but most of my other friends are rabid, and I have to say, A-Team was a ton of ridiculous fun! The plot is pretty by the numbers, but that's not the point. The A-Team is all about the ride, and it's a fast and furious one. 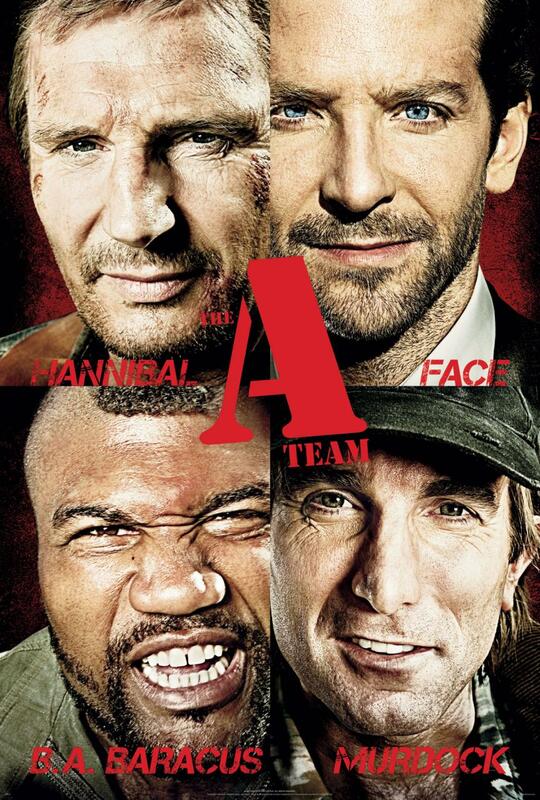 All of the characters are perfectly cast, yes even Quinton "Rampage" Jackson makes a fine B.A. Baracus, but the real stand out to me is the excellent Sharlto Copely as the crazy pilot, Murdoc. Copley proved himself a great new actor in last year's District 9, but here he really brings the funny and keeps you guessing as to what crazy idea he'll have next. The whole team has a really great chemistry and they play well off of each other, even during the downtime. It really helps you get invested in the characters and adds to the depth of the film. However, there are a few issues with the film. First off, it's a little redundant. There's an opening "getting the team together" montage and then we fast forward 8 years to the botched mission and then we get a "getting the team BACK together" montage. They're both cool sequences, but they seem recycled. That leads us into the second problem, The A-Team is a little too long. Not by much, but enough to be noticeable. Something must also be said about Patrick Wilson's performance as CIA agent Lynch. He starts off the film playing his role as a cautious, calculated villain, but about midway through the film throws all that out the window and goes into full cheesy bad guy mode. He was hilarious, but the switch was kind of out of left field. There's action a-plenty around in this film, but most of the time the camera won't stay in one place and a few of the sequences are confusing and hard to follow. It's like Joe Carnahan watched the Bourne films and decided to speed them up. There are two sequences that don't use this technique and they are AWESOME. If the whole film would have been shot like that, I'd call it the next Die Hard. All in all though, The A-Team did what any great adaptation should do. It captured the essence of its source material. Yeah, it could have been shorter and the action was a little disorienting, but the film really felt like it was the same four guys from the show up there and that's where it really counts, right?